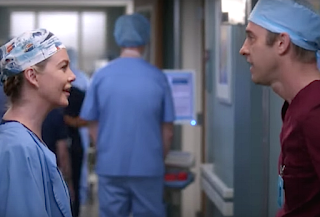 Budding romances, new and old faces, and a much-needed healing are the highlights of the latest episode of Grey’s Anatomy. Owen’s spur of the moment trip culminates into quite the reunion with Teddy, yet he can never seem to seal the deal. The much-anticipated arrival of Scott Speedman as a mysterious doctor definitely stirs the pot in a good way. And April finally meets her match in an unlikely patient. There’s a lot to love in this episode, so let’s dive right in. We all knew this day was coming, but ABC did a good job of keeping the exact date under wraps until the promo for this episode was released. Animal Kingdom star Scott Speedman arrives at Grey Sloan as a transplant surgeon visiting from the Mayo Clinic, who ironically is recovering from a kidney transplant of his own. When his first day back on the job becomes too much, he passes out on the floor of the hospital while talking to Meredith. Like the good doctor she is, Meredith takes excellent care of Dr. Mars. While he fears that he is rejecting the kidney that his best friend donated him, Meredith indulges his talkative side and keeps him company. The chemistry between these two is instantly palpable and just radiates off the screen. It is clear that Speedman and Ellen Pompeo clicked when they met because the immediate connection is beyond genuine. Mars is the perfect gentleman to Meredith, even though he is lying hopelessly in a hospital bed. He gets her to open up and have deep conversations in a way that we haven’t seen in years. It’s obvious that Meredith is feeling the vibe between them and has instant feelings for Mars; she didn’t even need to admit it to Alex at the end of the episode. Meredith is still reserved and knows that she can’t date a patient, especially one that lives in Minnesota. But at least she knows that maybe there could be room for more than her love for Derek in her heart if she wanted it. Thankfully, Meredith still has the option since she removed a blood clot from Mars’ renal vein and saved his life. While Speedman may have been originally booked for a one episode appearance, the chemistry is off the charts — meaning that fans are going to go rabid until he comes back. Mars isn’t the only character putting himself out there in this episode. In between episodes, Owen flies all the way to Germany to declare his love for Teddy. It’s always great to have Kim Raver back, and I’m sure we have all been missing her since her disappearance around mid-season. Teddy is very surprised to see Owen on her doorstep and seems to dig his declaration of love — for a few hours. Just when things seem to be going well for Owen and Teddy, Owen can’t keep his big mouth shut. Trouble in paradise ensues when Owen happens to mention that Amelia was right about he and Teddy belonging together. Naturally, Teddy is pretty shocked to hear that Owen came to see her because his ex-wife told him to do so. That would probably throw anyone off, which is why I didn’t understand why Owen thought that was a big deal. One minute he was planning his life with Teddy and the next she didn’t want to be near him. What could have gone wrong? Well, Teddy asks Owen when Amelia mentioned this, and his lack of immediate response leads Teddy to correctly guess that they had been sleeping together. To make matters worse, Owen admits sleeping with Amelia the night before and that this was when Amelia told him to be with Teddy. Teddy is a bit more than upset at this point and wants Owen to leave. I totally understand her point in all of this, and she has the right to kick Owen out. She tells him that she is tired of being his back-up girl and that he has never loved her enough to put her first. Owen tries to reason with her and say that he has always loved her — whether he really knew it or not — but that doesn’t have the desired effect. Unfortunately, it doesn’t look good for these two best friends to be anything more. I always thought they would end up together, but maybe that wasn’t in the cards after all. Meanwhile, April is treating a patient, Eli, whose skin is falling off due to an allergic reaction to antibiotics prescribed to him by Bailey. It is a pretty weird case and sadly, there isn’t much April can do to treat the new condition. April’s downward spiral continues as she insults Bailey and blames her for Eli’s deterioration — even though it’s not Bailey’s fault that Eli had a very rare, severe, allergic reaction. The only thing April can do is throw all of her attention at Eli and try to fix a mistake. Eli is a rabbi, and it turns out that he might have provided the guidance that April needs to get back on her horse. He sees through April’s latest façade and calls her out for being miserable. She tries to denounce Scripture and God, but Eli doesn’t let her rant. He tells her to grow up and accept the fact that just because you live your life strictly through faith doesn’t mean that everything is always going to be fair or good. Through some solid biblical examples and kind words, Eli manages to be the first person to really strike a chord with April. She seems to understand the point that she needs to have faith through the good and bad times. Even though Eli winds up dying, April appears to take his message to the heart, judging by her voiceover at the end. Hopefully, April can turn a new leaf and get her life back on track now.